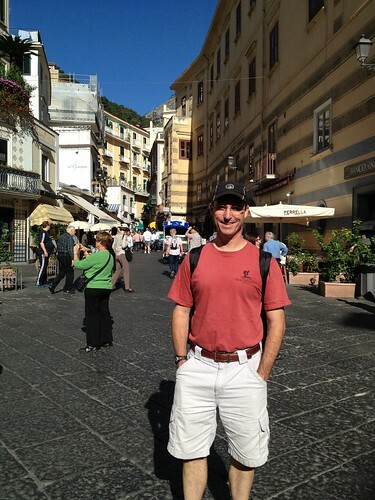 Weasel's Journey: Anniversary trip to Italy, part VI. 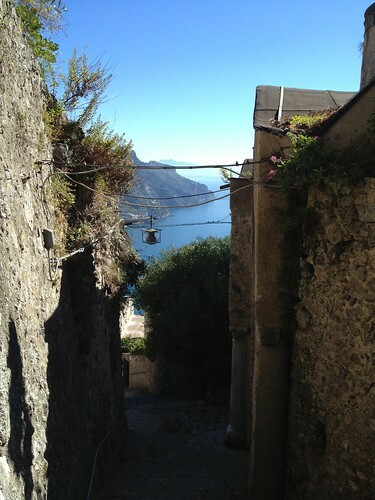 Anniversary trip to Italy, part VI. 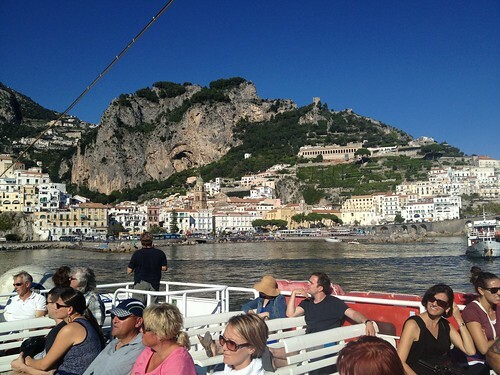 Robert and I caught the 10:00 boat from Positano to Amalfi town this morning. 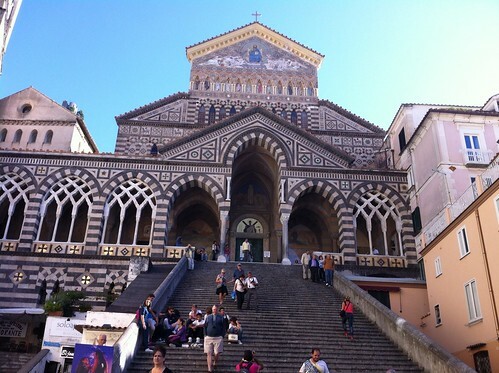 We wandered briefly around the town square and admired the beautiful neo-Byzantine facade of its church before boarding a bus for Ravello. 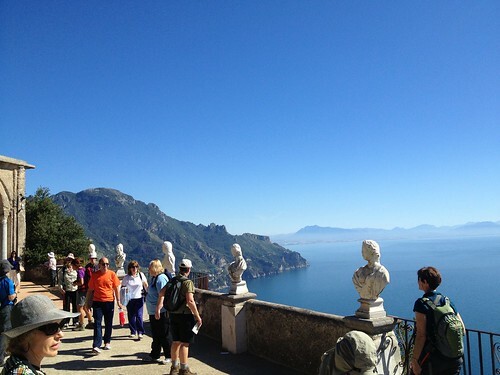 Ravello is situated some 1000 feet above the sea and is a charming town with fabulous views. We walked through its church and past the ruins of the Villa Rufolo to the beautiful expansive gardens of the Villa Cimbrone. 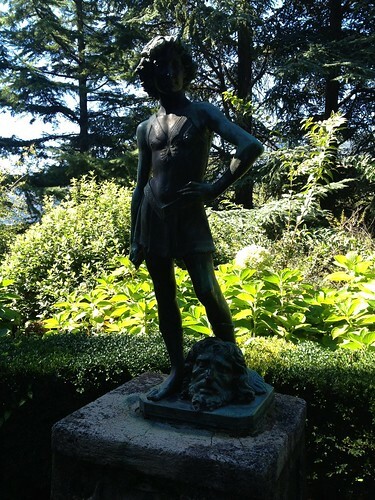 The "Terrace of Infinity" on the Villa Cimbrone's grounds afforded an especially magnificent view, and we also enjoyed the various smaller gardens with their little statues and lush vegetation. 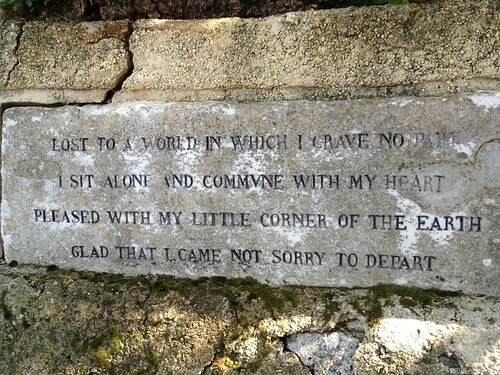 I liked this inscription at Mercury's Seat on the grounds of Villa Cimbrone. It is D.H. Lawrence's version of a poem by Cattalus dating back to 60 B.C. 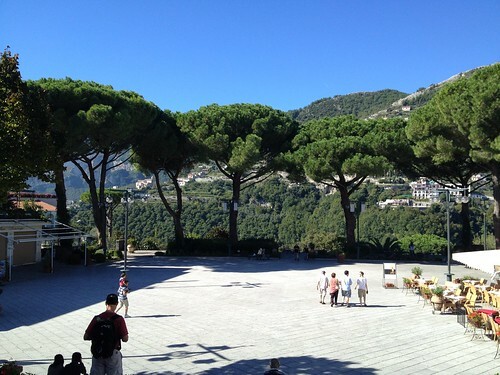 We caught a bus back down the mountain to Amalfi. 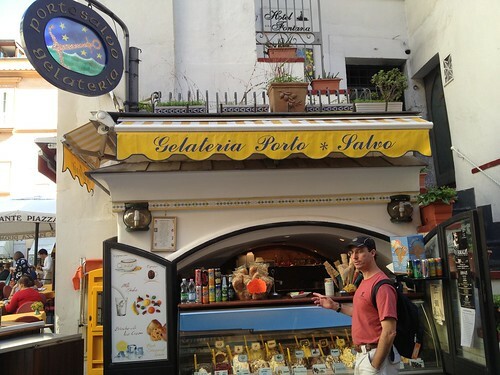 Before boarding our boat back to Positano we stopped for some very tasty gelato at the Gelateria Porto Salvo on the main square. 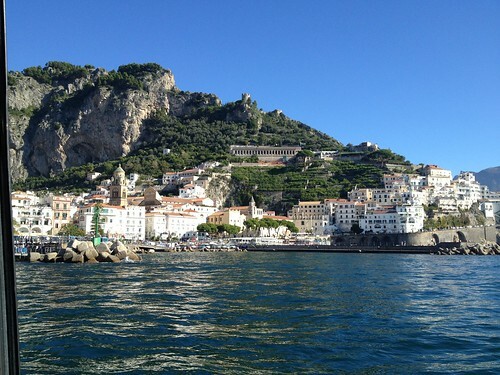 The boat ride along the Amalfi Coast was beautiful. The towns were lovely to view from the sea, and it was fun to look up at where we'd hiked the day before. 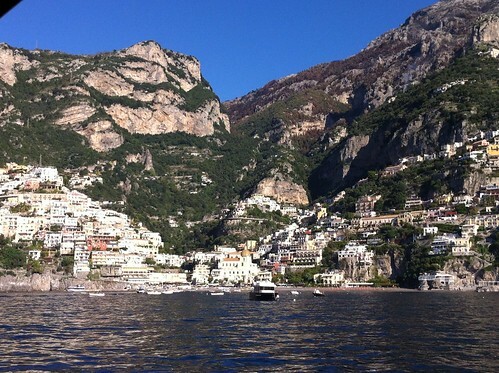 Upon arriving back in Positano, we climbed the steps from the beach up to the Hotel Marincanto. As we passed the hotel pool, Robert and I remarked to each other, "That looks fabulous!" so we spent the afternoon relaxing at the pool enjoying a Bellini and snacking on some delicious olives. 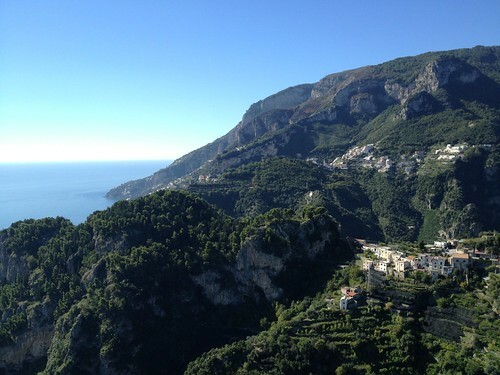 We had booked dinner reservations at a restaurant called La Tagliata that was high on the mountain above Positano in a town called Montepertuso. 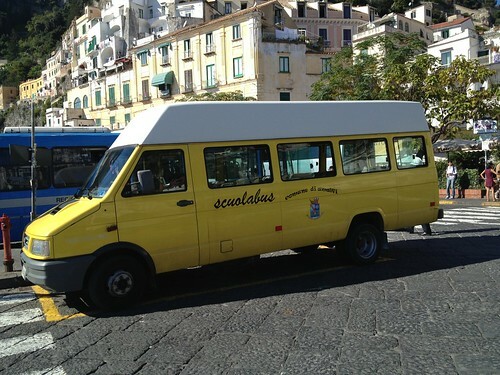 The restaurant sent a bus to pick us up at our hotel. We met a nice couple on the bus from St Louis and decided to eat dinner with them. La Tagliata serves everything family-style, and they bring a huge selection of food to the table (you don't order; they serve everyone the same selections). 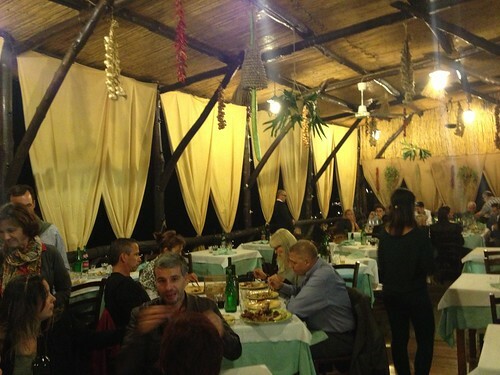 There must have been eight or ten antipasto dishes, four pastas, five or six grilled meats and four desserts in addition to wine! Everything was delicious, and we ate way too much. Midway through our meal a lady broke out a microphone and regaled us with some Italian music. We also enjoyed a great visit with our new friends from St Louis. All in all a fun and memorable evening! Pasta course - so good! 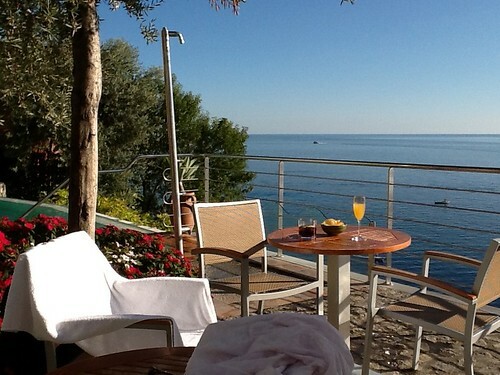 Robert and I enjoyed one last breakfast on the lovely terrace at the Hotel Marincanto before departing for Rome. 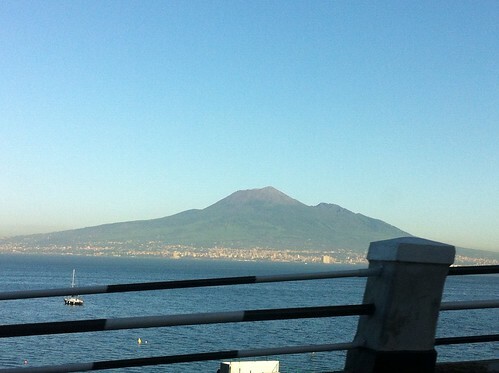 The hotel had arranged for a driver to take us to the Naples train station where a fast train for Rome leaves every hour. 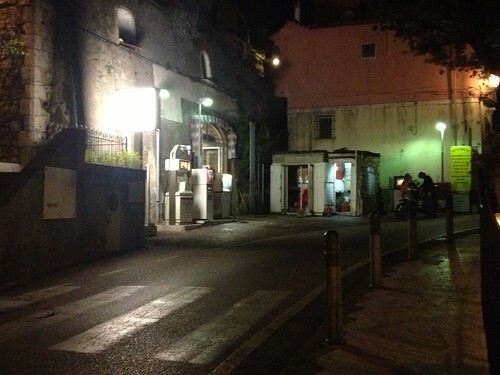 We hit terrible traffic in Naples but were able to catch the 11:50 train which got us to Rome right at 1:00. 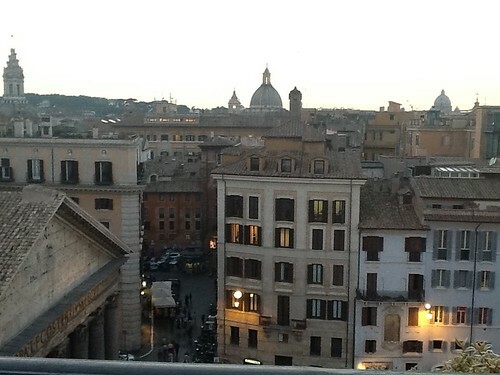 We took a taxi from Rome's Termini train station to the Albergo del Senato and checked in for our last night in Italy. Our room was #212 (handy because it was the same number as our room in Positano and it had taken me three days to learn to say that in Italian!). This room was smaller and did not have a view of the Pantheon like our previous room, but it looked out onto a pretty courtyard and was still quite lovely. 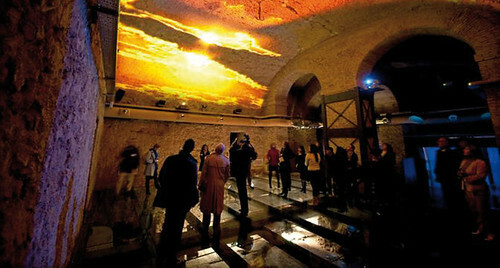 Amanda Ruggeri, on her Revealed Rome website, highly recommended Le Domus Romane di Palazzo Valentini, as a very cool, cutting-edge ancient underground site. 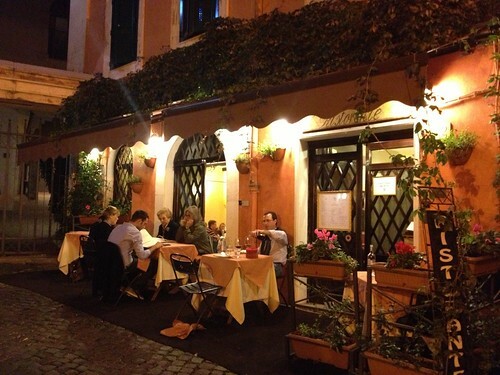 TripAdvisor.com also cited Le Domus as the #1 attraction in Rome. Intrigued, I decided we needed to see it for ourselves. The English tours were sold out for the first weekend we were in Rome, but I managed to buy two tickets for the 2:30 tour today. 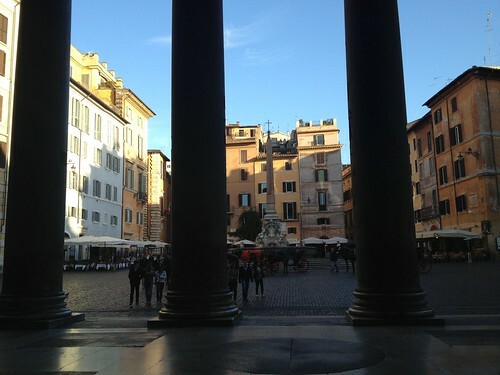 The tour began in a tiny office inside the courtyard of the Palazzo Valentini, which serves as the government offices of the province of Rome and is located just around the corner from Trajan's Column and the Vittorio Emmanuel Monument. The ruins of two incredibly opulent, Imperial Roman villas were discovered beneath the Palazzo when officials attempted to build a parking garage there several years ago. Our guide led us down stairs of plexiglass situated several feet above an ancient staircase. We stopped in a room that had been used as a steam bath in one of the villas. As we stood on a clear floor above the ruins, a recorded voice described various aspects of the chamber while lights illuminated different areas to direct our attention and to recreate what different portions of the room would have looked like. In one room with a beautiful mosaic floor, the intact section was highlighted first, then a computer generated the rest of the floor as well as the walls, so we could picture exactly how the room appeared in ancient times. It was really neat! The tour continued through several rooms of both villas and finished with an explanation of some current excavations being done around Trajan's Column. The multimedia presentations were incredibly interesting and effective, and Robert and I both enjoyed this experience. I wish someone would duplicate it for all of the ruins in Rome! 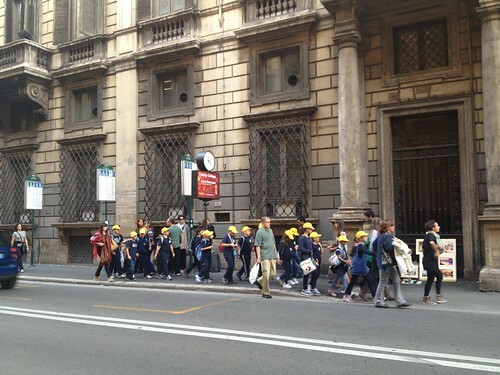 We left Le Domus around 4 and walked back to the Albergo del Senato. I stopped in a culinary shop to buy some food items to take home as gifts and souvenirs before retreating to the hotel rooftop to write postcards and work on my trip report (with my requisite Bellini and a bowl of olives). 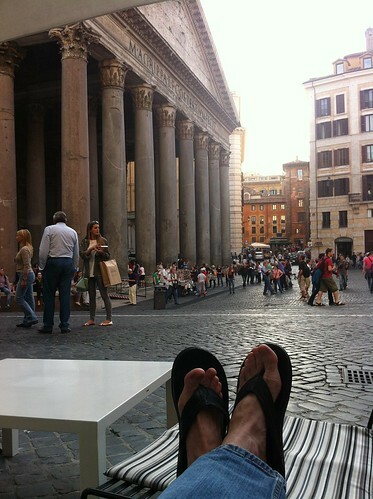 Meanwhile Robert relaxed in the Piazza della Rotunda in front of our hotel. Wonderful food shop near our hotel. 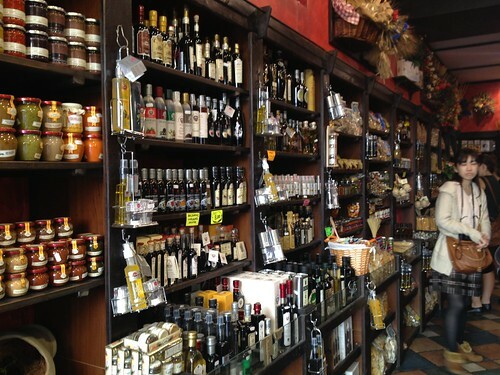 I bought several bottles of balsamic vinegar as well as some truffle, olive and pepper spreads. Of course I also sampled a lot of items! My view from the hotel rooftop - ah! 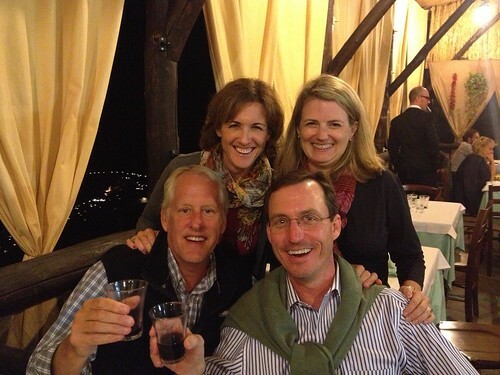 For our last dinner in Italy we ate at Ristorante Santa Cristina al Quirinale. 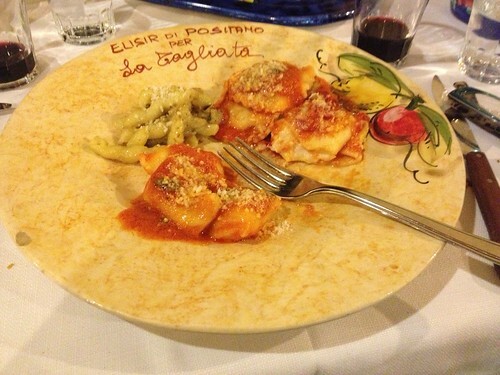 My Aunt Martha had told me this was her favorite restaurant in Rome, and I would say it was our best overall meal of the trip (that's saying a lot because we ate very well everywhere we went). Robert and I shared a "mezzo" (half-liter) of the house red wine and a first course of mushrooms stuffed with various cheeses. For his entrée Robert had a filet in peppercorn sauce that was fabulous, and for mine I ordered an absolutely delicious penne pasta with a tomato vodka sauce. 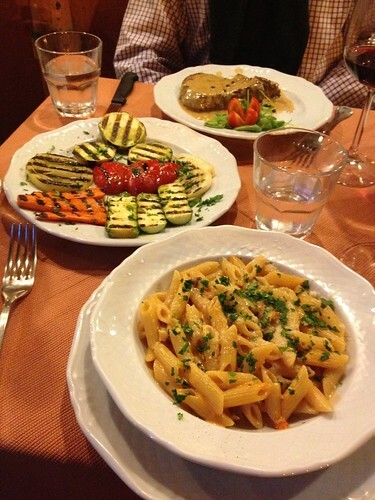 We also enjoyed a side of very tasty grilled vegetables. 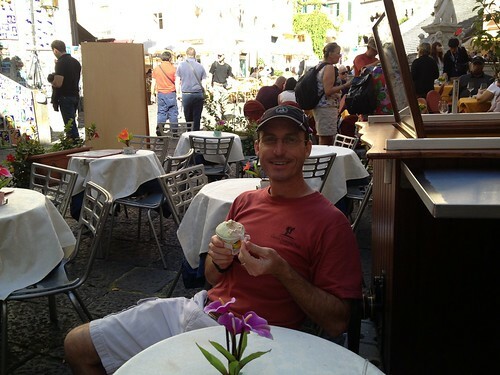 A neighboring table ordered an apple torta for dessert that looked extremely tempting, but Robert and I decided we needed one last cup of gelato, so we took a leisurely stroll through the Piazza Navona and stopped at Frigidarium before returning to our hotel to pack. 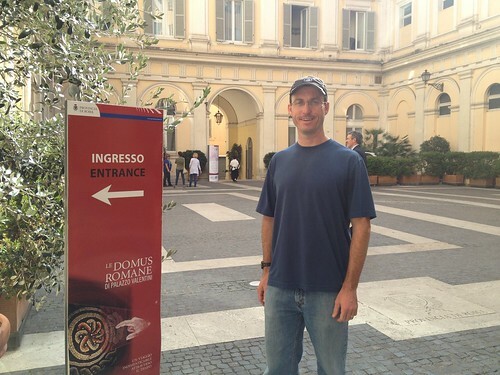 Robert arose early to run around the streets of Rome, while I slept a little longer and then took a quick stroll in an effort to drink in as much of Rome's beauty as possible before our impending departure. 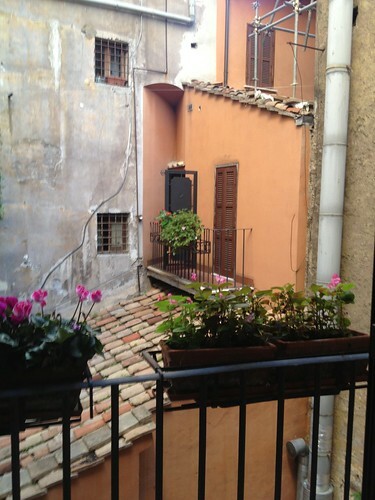 We enjoyed breakfast in Albergo del Senato's pretty morning room before a driver picked us up to take us to the airport. 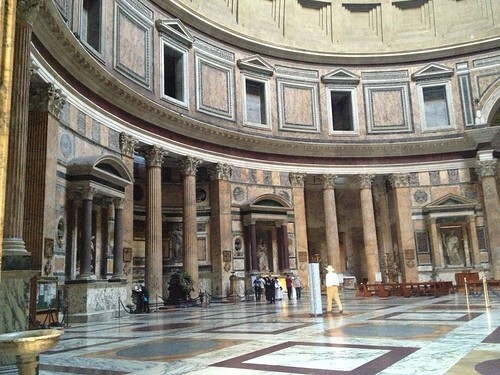 Inside the Pantheon - so empty this early in the morning! What a wonderful trip this was! 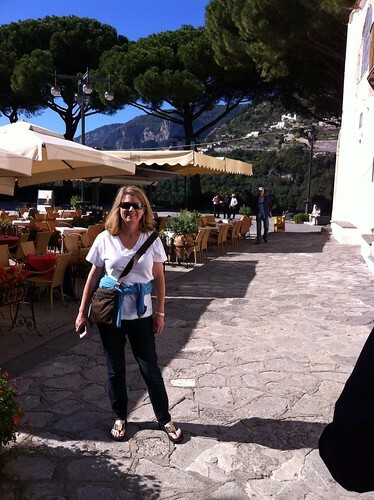 Each time I try to name my favorite part (the Path of the Gods, the Arco Naturale in Capri, the underground tour at the Colosseum), I remember at least as many other highlights (the Vermeer exhibit, Le Domus, dinner with Aunt Paula and Uncle Terry, gelato, the afternoon at the pool in Positano). 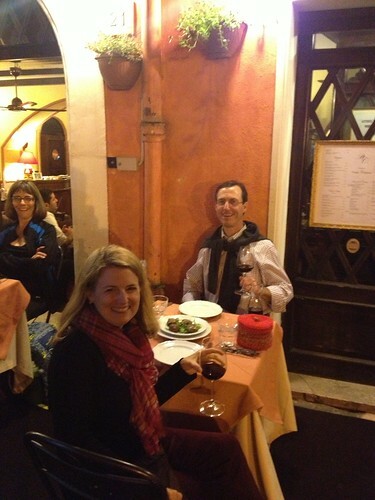 Robert and I are already plotting our next trip to Italy. Anyone care to join us? Having a ball in New Orleans. 1962: It was a very good year, part II. 1962: It was a very good year, part I.